GOSH HE IS SO POWERFUL!! Too classic, man! Nice work! Imposing as all get-out. It's only fitting that he looms larger-than-life and that the viewer's perspective is that of a subservient whelp. 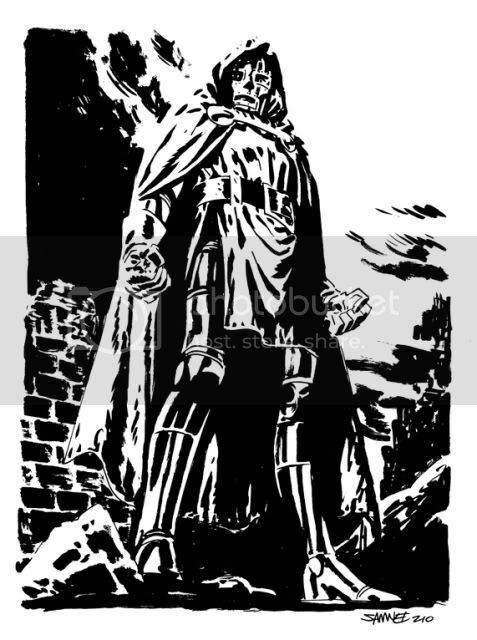 Long live Lord Doom! Majestic and powerful - just the way Doom should be. Impressive.I really like your use of black and white,negative shapes vs. postive,etc. Just saw this rite now, this Doctor Doom is awesome so glad I suggested this on twitter. It's awesome that Chris does this with his fan base. Great art, Great artist.